Turkey Day is over and now the 2015 Christmas odyssey is underway. My personal pilgrimage began Sunday at 5 AM, as I prepared my wife's medications for the week. There are fourteen different pills she takes at different times during the day for varied reasons and I do this every week. So, I pour a cup of coffee and spread the pill bottles in a row in front of my still-squinty eyes. I have a pill box with four rows of sevens so I can prepare meds for the entire week. The morning row gets five pills in each box, the noon row gets four, etc. When I am finished there are 112 pills sorted out for the week. I am proud of my system...most of the time. I finish placing the the last pills in place and reach over to get the coffee. Ah yes, life is always an adventure. That's right; I knocked over the coffee. As I did, I leaned onto the bottom of the pill box and it flipped, ever so gracefully, end over end into the air spraying its newly received contents everywhere. Okay--you get the picture. Pills on the floor, pills on the table floating in coffee (too bad they were not donuts) and me staring, mouth hung open, in disbelief. Fortunately, God has blessed me with a self-deprecating sense of humor. I took a breath and began to laugh. Then I created some dialogue for the moment. I raised my hands, looked out across my random pill and coffee display, and announced to no one, "You are such an idiot!" Then I laughed some more and began Round Two of the weekly pill dissemination. That time I succeeded. No matter, Christmas is my favorite time of the year. I love the 'reason for the season' which is the Baby Jesus. I love the awe in the faces of so many children and the extra smiles that come from the wonder and mystery surrounding Santa's impending visit. I love the cookies and candy and cake and even some of the anxiety and pressure and insanity that mixes in as we move forward. I even love eggnog, fruitcake and pfeffernuesse. I am a hopeless Chrismatist. More than anything, I love thinking about the Holy Family. Have you ever really thought about the Blessed Mother when she was a young girl about 14 or 15 years old? She was almost full-term in her pregnancy and was forced to travel on the back of a donkey for over 80 miles to fulfill the census law. We have to marvel at her husband, Joseph, who must have just loved her so much that he was willing to accept her Baby as his own. 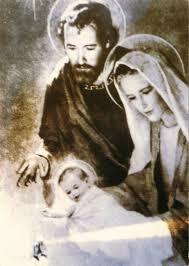 He led her and the unborn Child on this journey, protected them with his life and made sure that the Savior of all mankind lived to complete His mission. This was, after all, a very different time culturally. Mary's alternative could have been death by stoning. Thank you, St. Joseph. Thank you, Mother Mary. Thank you, Jesus. I will finish this up by telling you I made it to eight o'clock Mass with the wife at my side. What better way to continue the day, especially after the pill and coffee fiasco. Yes, the Season of Advent is upon us. I have no idea how the rest of this day or the days following will play out. No matter what, it will be OK. We are on our way to Christmas. For all of you willing to embrace the season, it is a beautiful, wondrous time for family, friends, love, joy and miracles. The simplicity of the Thanksgiving Holiday captured my spirit decades ago. This is the one day of the year where we, as Americans, just stop everything and take a breath from the year gone by to say THANK YOU to God for all that we have. We gather with family or friends or maybe even with strangers in a food center who become our new friends, and share the bounty He has so graciously bestowed upon us. All we have to do is "show up". You do not even have to bring gifts. Just bring a thankful heart and a smile on your face. It doesn't get any better than that. It is a beautiful thing. So I would like to wish anyone who might read this a God filled and beautiful Thanksgiving Day. I am posting two Thanksgiving prayers that fit the occasion. Thank you, Father, for having created us and given us to each other in the human family. Thank you for being with us in all our joys and sorrows, for your comfort in our sadness, your companionship in our loneliness. Thank you for yesterday, today, tomorrow and for the whole of our lives. Thank you for friends, for health and for grace. May we live this and every day conscious of all that has been given to us. The quote above comes from an 18 year-old student who lives in Paris. I do not know her name. On the Monday morning after the Friday of Satan, she left class and stopped at a cafe for a cup of coffee. The headline of the newspaper read, Sorrow and Rage. She thought, "What should I do?" I also believe she has unintentionally demonstrated to the entire peace-loving world that our most powerful weapon available in the war on terror is prayer. I know we pray for world peace in our churches on Sundays and in our homes, or maybe by ourselves; but this weapon is available to us all. It costs nothing, requires no munitions factories or raw materials, and does not have to be safeguarded or transported carefully. Where weapons of destruction are designed to destroy and obliterate lives prayer has the power to change, transform and convert bad to good and hate to love. Prayer can conquer evil....bombs, bullets and chemicals CANNOT. The secular world has been rejecting this most potent weapon as outdated and a relic of the past. It is NOT. This is what we must pull back to the forefront, not randomly or incidentally or alone when we can, but together. We need a unified and all out assault on Satanic fueled terrorism and evil using prayer as the infantry rifle in the hands of every believer all over the world. This is how we can help to crush the serpent's slimy head. This is the answer to peace. Prayer--followed by physical action if necessary. Leadership for this new D (Demonic)-Day should start with Pope Francis who can instruct the bishops the world over to orchestrate simultaneous prayer events around the planet every day. The Bishops can instruct their parish pastors and priests to gather their flocks together. This prayer assault can be taken up with all Protestants and Jews and even the "nones" who do not recognize any religion. If the secularists object---too bad. A bit of history relating to the power of prayer. On October 7, 1571, the most significant, crucial and profound naval battle ever fought took place. Known as The Battle of Lepanto, this is the battle that saved the Christian West from an impending defeat by the Ottoman Turks. Vastly outnumberd with ships and men, the victory at Lepanto prevented the Christian world from being taken over by Islam. So how does prayer fit into the Battle of Lepanto? Pope St. Pius V had formed what is known as the Holy League, combining the maritime nations of Europe so as to be able to defend themselves against the Ottoman Turks. Prior to the Battle of Lepanto the Holy Father ordered the rosary to be said throughout Europe. The Pope led a candlelight rosary procession through Rome the night before the battle. In addition, all the men with the fleet prayed the rosary. The resulting victory was attributed to the intercession of the Blessed Virgin Mary. To this very day October 7 is celebrated as The Feast of the Most Holy Rosary aka The Feast of Our Lady of Victory. Unfortunately, most Americans have not even heard of the Battle of Lepanto. The possibility that the West could be under Islamic rule today was just one day and thousands of prayed rosaries away. It never happened. It seems that some serious prayer might be once again in order. Political correctness be damned--The power of prayer is the key to crushing ISIS, Boko-Haram, Al-Queda, Hezbollah and all the rest of these Satanic fueled barbarians. We ALL need to get busy praying. The United States Department of Education's Office for Civil Rights, imbued with the secular wisdom of the 21st century, has decided that a suburban Chicago High School is denying a "transgendered" student his/her rights because it does not provide "full access" for him/her in the girl's locker room. (I am using the pronouns, he & she or him & her because the individual who insists he/she is a female has male genitalia.) And, just so you know that I sympathize with "Gender Identity Disorder" , the highlighted link is to my post on the subject from July of 2014. The student in question is allowed to use his/her's gender-identified locker. He/she is simply asked to shower behind a curtain in a shower stall provided for his/her use. It seems to me this is as accommodating and as reasonable as you can get. The person has decided that they are a girl but has a man's body parts. The student in question stated, "The district policy stigmatized me, often making me feel like I was not a "normal" person." Sadly, my friend, even though the Government of the United States of America has decreed you are "normal", you are NOT. Therein lies this great dilemma. Why should teenage girls be subjected to being exposed to this aberration? After the individual complained that he/she was not treated fairly, the Feds stepped in and decided that his/her Title IX rights were violated by not allowing him/her "full access" to the locker room. It followed that the school district has been threatened by the Feds and, if the district does not comply with their "non-discrimination" rules, it could face a criminal investigation and lose up to $6 million in federal money. This is where we see MORALITY, DECENCY, DIGNITY, and RESPECT washed down the drains of those shower stalls. Is there not common decency in play here? Is there no "two-way street"? Is everyone who claims some kind of anatomical, sexual or gender-preferred existence a VICTIM? Do not these other girls deserve the right to their own personal dignity? Where is the simple thread of common decency? It is obvious that the U.S. Department of Education's Civil Rights Office has thrown the word Respect onto the trash heap of words abhorred by the PC community. How easy will it be for some teenage boys to get together and decide that one of them should claim "transgenderism", dress up like a girl and demand to go into the girls' locker room and get naked. The guy could slap on a wig and claim he is "transgendering". It would be their greatest prank of the school year. Also, are not these young women being put at risk to become victims of sexual deviancy and/or abuse whether it be emotional, psychological or physical? This entire concept of "me, me, me" and "my feelings" has somehow captured the imagination of the fools in power who never looked in the dictionary to see what the word NO meant. Either that or they do not give a damn because the only thing that matters is their ideology. A person who is a male is NOT a female and a person who is a female is NOT a male. Just saying so and expecting others to accept it is unreasonable, to say the least. Gender Identity Disorder (now called Gender Dysphoria) can be a serious problem for those who truly have this condition. If they are having a problem understanding the gender they have been born into, there are medical and psychological pathways available to help guide them on their transformative journeys. The federal government, under the Obama administration, cares nothing about all the other Americans boys, girls, men and women who consider themselves boys, girls, men and women...oh yes, and also identify as heterosexual. The fact is, we all have rights, each and every one of us. The heavy handed methods of persuasion that the Feds are using is opening up an entire pathway for the abusive and deviant to ply their evil. All the school wanted the student to do was shower behind a curtain. They reasonably addressed a complex situation and dealt with it in a logical and understanding manner. Then the federal government got involved.